Home Blog Apple Mac Find out what Apple have planned for the iPad and Classroom! 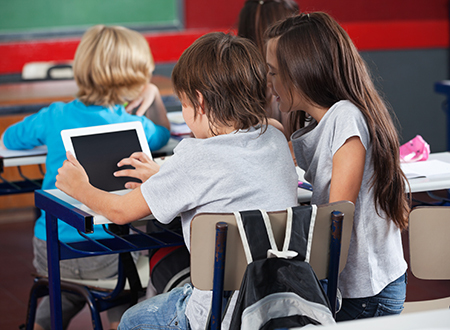 Find out what Apple have planned for the iPad and Classroom! more: user-friendly, accessible and by developing both hardware and software that make them more easily applicable and relevant for teachers and students. This blog highlights and explores some commonly asked questions about 2 of Apple’s new Apps, planned for release later this year along with their new classroom friendly iPad. The Classroom app acts as a teaching assistant that allows the teacher control of every iPad in the classroom. This is to help keep students focused, even when they’re not doing the same thing. Available for iPad with a beta version for Mac available in the summer. Q. What’s new with the Classroom app? A. Additional management features and a new look has come to Classroom! Teachers can now lock student iPad’s using a specific app from the Navigate command, and restrictions that require students to get permission to exit any teacher-created classes from a supervised device. Q. When will Classroom for Mac be available? A. This Summer (2018) through AppleSeed for IT. Everyone Can Create is a new curriculum designed to teach students the art of expression through video, photography, music, and drawing using iOS apps built into every iPad, like iMovie, Clips, Pages, and GarageBand. The curriculum includes a Student Guide with hands-on projects and a Teacher Guide that helps teachers find fun and meaningful ways to bring these skills into any lesson, topic, or assignment. Q. Why is Everyone Can Create important? A. Everyone Can Create gives students the opportunity to learn app based skills on iOS dedicated apps like; iMovie, Clips, Pages and GarageBand. Q. How do I access the Everyone Can Create preview curriculum? A. Preview books are available in the iBook’s Store. You can access the Teacher and Student Guides at https://www.apple.com/education/everyone-can-create/ or on the iBooks Store. You can link directly to the Teacher Guide at itunes.apple.com/book/id1357353934 and the Student Guide at itunes.apple.com/book/id1357353820. Q. Will teachers be able to test Everyone Can Create at local Apple Stores? A. From May, your local Apple Store will have programming inspired by the Everyone Can Create curriculum. Q. When will the Everyone Can Create curriculum be out of preview? A. The Everyone Can Create curriculum for elementary and middle school will be available from September, and will continue to be updated over time. It’s certainly exciting to see what Apple have in store for the classroom! Find out more about our leasing options for schools here, and give your classroom access to the best for less! If you have any questions call our Apple certified team on 0207 1111 643 who will happily answer any questions or online using our WebChat feature.